The future of design was a hot topic at the London Design Festival 2013, and some of the most optimistic and cutting edge concepts for the future were at The Fifth Element, a new platform for showcasing projects exploring science, technology and process in design. Part of Designersblock at the iconic Southbank Centre, The Fifth Element envisioned designers taking more inspiration from science, medical equipment made from everyday household goods, and society making the most of everything - even spoiled milk! Featured projects at The Fifth Element ranged from the playful to the practical to the poetic. Blow by Florian Dussopt is an interactive LED light installation that is activated by visitors blowing into a pinwheel. Domestic Science Machines include a salad spinner-turned centrifuge and other household appliances given scientific functions. Design for Death imagines a final transformation, sending ashes after cremation into the clouds to make rain. 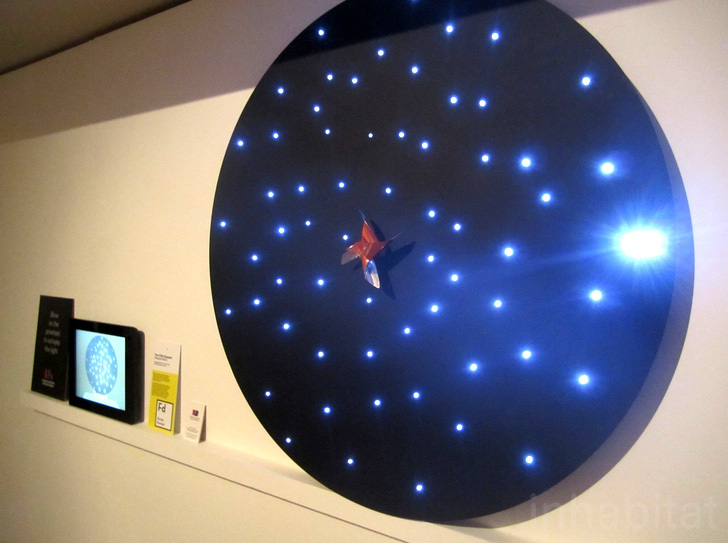 Multi-disciplinary collective Jiggling Atoms made a big impact with multiple projects showing the fun and thought-provoking outcomes when design and science meet, from Musical Jelly to hand-drawn optical illusions to plates decorated with the patterns of lab specimens. There’s plenty of pessimism about the challenges the world faces, but the concepts in The Fifth Element are a reminder of the promise technology, science and design have for turning things around. It’s refreshing to get a vision of a future that’s less dystopian, and more delightful. This is a world we can look forward to living in! Lisa Mallinson's Circus for One illustrations are stunning hand-crafted optical illusions inspired by investigations into how our eyes detect light rays and how they can be deceived. Playing with anamorphosis, the process initially developed in the late Renaissance of reading images through curved mirrors or 3D shapes, she starts with detailed ballpoint pen drawings that are then distorted with Photoshop and anamorphMe software. 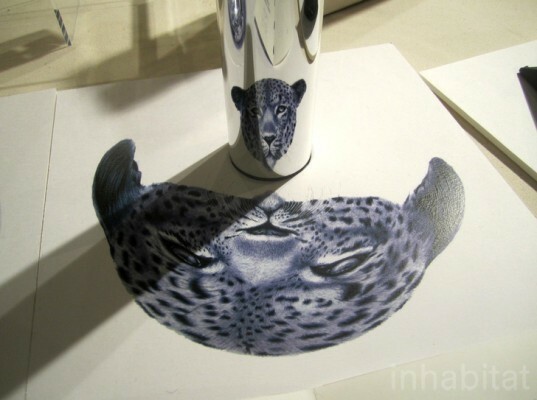 The resulting artworks can only be clearly seen in reflections, as is the case in this Cylindrical Mirror Anamorphosis leopard. Histology, the study of the microscopic anatomy of cells and tissues, is the inspiration behind medical illustrator Emily Evans' colorful ceramics. The patterns are derived from actual human tissue samples that have been stained and photographed by a histologist at Cambridge University. Sold through the Anatomy Boutique website, the Histology fine china collection is handmade in the UK. Artist and medical illustrator Jennifer Crouch's pieces are very much inspired by her postgraduate studies and her work in a dissecting room. This laser-etched pattern is directly borrowed from laboratory specimens. Recent graduate Josh Barnes' Shadow Memories bench is a reaction to the "on-demand" nature of digital memories in the age of Flickr and Facebook. The site-specific bench is designed as a sundial, and with its accompanying augmented reality app, visitors can capture the unique shadows cast by the moving path of the sun as digital memories that can only be accessed when the exact same shadow reoccurs a year later. Alex Duffner's Domestic Science Machines give scientific functions to household appliances. A slow cooker is re-imagined as a PCR Cycler for isolating and multiplying DNA sequences for analysis. A salad spinner is commonplace in household kitchens for extracting excess water from greens, but Alex Dufferin reimagines it as a centrifuge, predominantly used for separating blood into its basic components in lab settings. A hacked coffee machine is turned into a spectrometer that can analyze the chemical composition of the very coffee it makes. The Domestic Science Machines are a concept for making science experiments more accessible to a wider audience. Have a carton of milk just past its expiration date in your fridge? We may see it as garbage, but industrial design graduate Masami Charlotte Lavault sees potential -- and plastic. Building on a material developed in the 19th century, she devised a new molding technique that allows expired milk to be transformed into a strong plastic that can be turned into stools or protective gear for farmers. An estimated 15 billion liters of milk are wasted in European households a year, according to the Food and Agriculture Organisation. Masami Charlotte Lavault's project The Milk of Human Kindness developed a novel process for turning old milk into a moldable, biodegradable plastic. The milk is mixed with pigment and acetic acid before being turned into a powder, pressed into a mold and put through a pressure cooker to set its form. Patrick Steveson-Keating's Design for Death aims to transform human remains into rain through cloud-seeding. The micro airship is designed to lift and disperse cremated ashes into the clouds, where water vapor can condense around them. Chloe Campbell's "B is for Boric Acid" table is screenprinted with a design inspired by the atomic pattern of boric acid, which can be found in wood preservatives. The project was inspired by the idea of making visible the normally invisible world of science. Caz Slattery's "I don't think you're ready for this Jelly" turns common gelatin into a Jelly Orchestra with the help of salt and an Arduino. Using a metal spoon, visitors could play the jelly molds by tapping on them, triggering different sounds, similar to this algae jelly instrument. So enthusiastic were visitors through the course of London Design Festival that she had to make more than 100 little jellies over the course of the week!